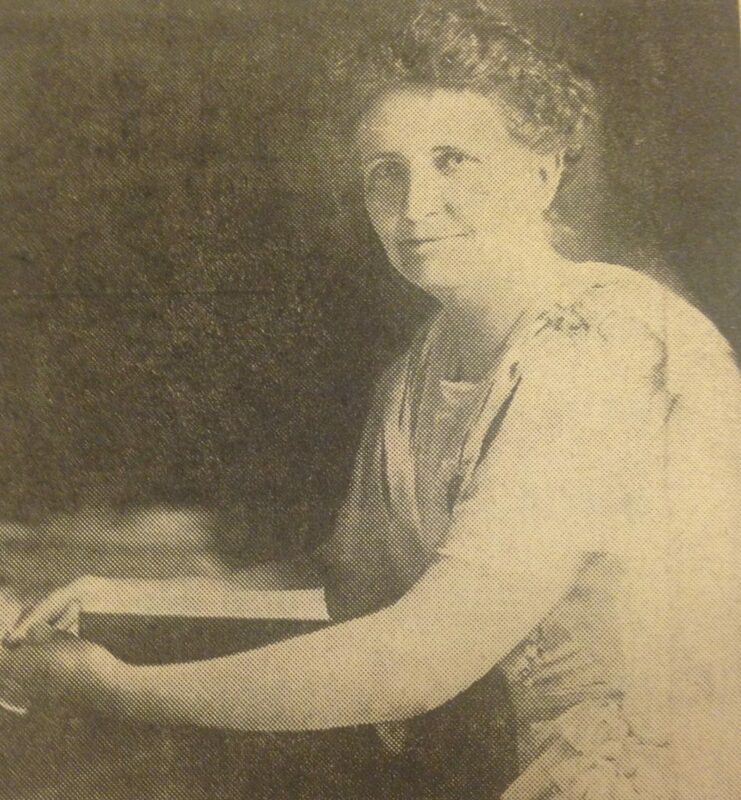 Jennie C. Ralston, wife of Governor Samuel Ralston, First Lady of Indiana (1913-1917), image courtesy of Indianapolis Star. Tracking down a portrait of Jennie C. Ralston, wife of Indiana Governor Samuel Ralston, was our most pressing challenge last week. The problem? It appeared as though no one had actually seen the painting since 1970. When we got a call from Jennie’s great-great granddaughter, who thought the portrait had been donated to the Indiana State Library, we were honored to help track it down. Though most well-known as wife of Indiana Governor Samuel Ralston, Jennie was a civic leader in Indiana in her own right. Born on November 15, 1861 on a farm near Danville, Indiana, she met Samuel while attending Central Normal College in Danville. She graduated in 1881. The two married in 1889 and lived on a farm near Lebanon, Indiana. Throughout her life, she participated in numerous clubs, often holding leadership roles. A few of her positions included President of the Pioneer Woman’s Memorial Association, in which she helped organize the Parent-Teachers’ Association, Trustee of the Indiana Girls School, and Vice-President of the Indiana Federation of Clubs. She was also a member of the Democratic National Committee from 1934 until she retired on her 91st birthday in 1953. Samuel and Jennie Ralston sitting together on their front porch, c. 1922-1925, image courtesy of Indianapolis News. governors (except for one) since Indiana became a territory. The state museum makes sure every newly elected governor has their portrait painted and added to the collection. Most of the paintings are currently on display in the State House or in government offices. Portrait of Indiana Governor Samuel Moffett Ralston by Wayman Adams in the Indiana Governors’ Portrait Collection. It was possible the collection contained Jennie’s portrait. When he was governor (1913-1917), her husband Samuel significantly expanded the collection. In honor of the state centennial in 1916, he had his own portrait completed by Muncie artist Wayman Adams, and hired T.C. 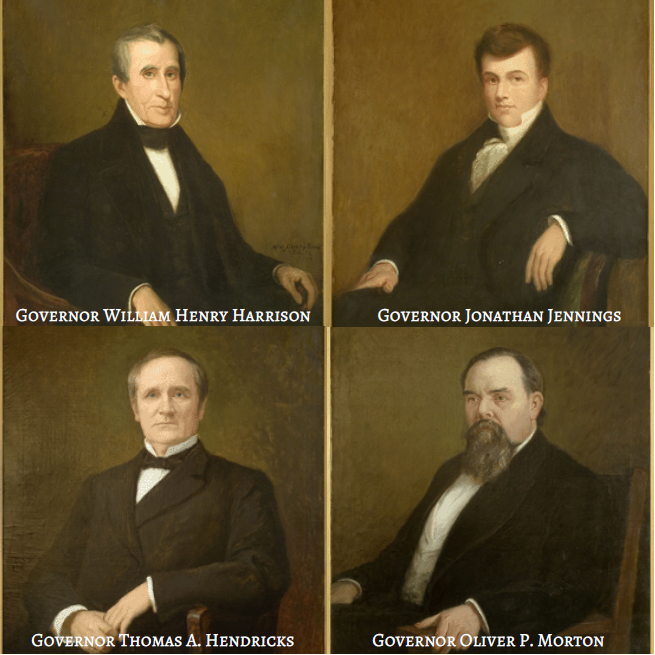 Steele to paint portraits of four famous Indiana governors, William Henry Harrison, Jonathon Jennings, Oliver Perry Morton, and Thomas A Hendricks. However, no records indicated that Jennie’s portrait came with her husband’s to the Indiana Governors’ Portrait Collection. We contacted nearly every other major archive and museum in Indianapolis and no one seemed to have record Jennie’s portrait in their collection or knew where it currently was. Steele’s portraits commissioned by Gov. Ralston, courtesy of IHB. Next, we scoured books and digital publications for reprints or references of Jennie’s portrait, with the hope that a citation might lead to a repository that currently owned the painting. After searching through several books from First Ladies of Indiana and the Governors to Portraits and Painters of the Governors of Indiana, there was still no trace of the portrait. Without paperwork, the name of the artist who completed the portrait, or even an image of the painting itself, it seemed difficult to know where else to look. However, there was one source left to check. Perhaps one of the best places to find information at the Indiana State Library is the trusty clippings files, collected in the 1920s and having grown to nearly 250 linear feet since then. The library maintains a vertical file of clippings from newspaper and magazine articles, pamphlets, and various publications on a number of Indiana topics for public perusal. There are folders dedicated to broad subjects, such as women or health, and others for specific individuals, events, places, and organizations. 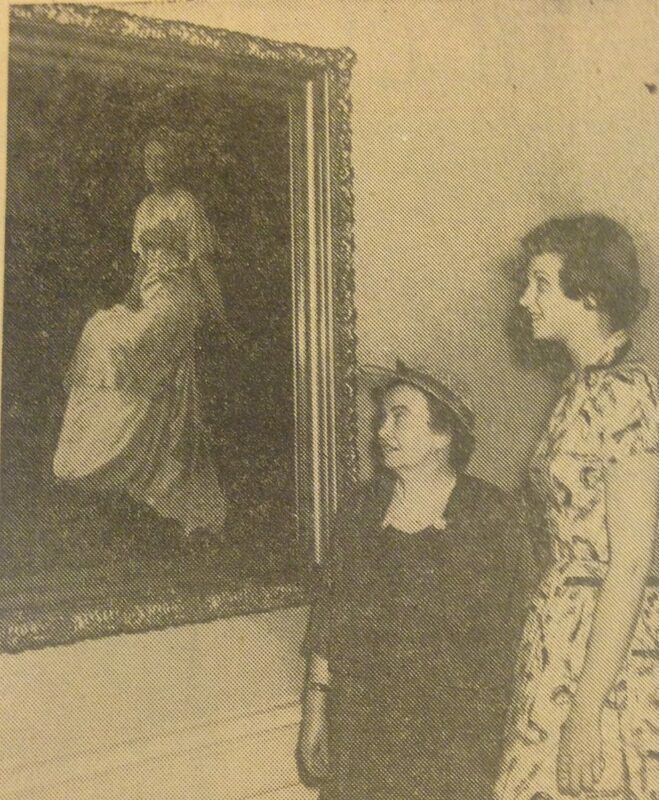 Jennie Ralston’s niece, Ruth Cravens (left) presents the portrait of Jennie at IU’s Sycamore Hall girls’ dormitory at. This photo led us to the portrait’s current location in the IU Campus Art Collection. Image courtesy of Indy Star. 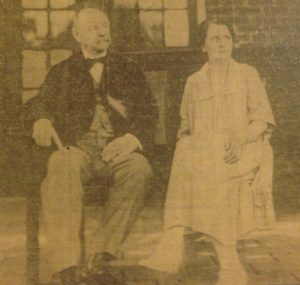 Luckily, Samuel and Jennie Ralston had a folder dedicated to them in the biography section of the clippings files. Ironically, the first clipping in the folder was a small captioned photo cut from the Indianapolis Star, dated May 22, 1956. The photo showed the portrait of Jennie Ralston presented at the Sycamore Hall girls’ dormitory in Indiana University-Bloomington. Apparently, Jennie’s brother John Cravens, worked at the university as a registrar for many years. Eventually, we connected with the Campus Art Collection at Indiana University. After sending a scan of the article, Amy Patterson, Campus Art Collection Manager and Registrar at Indiana University told us Jennie’s portrait was indeed in their collection. SUCCESS! The portrait is currently in storage to undergo restoration and will be rehung next summer. Moral of the story; always check the ISL Clippings Files. You never know what you’ll find in there.